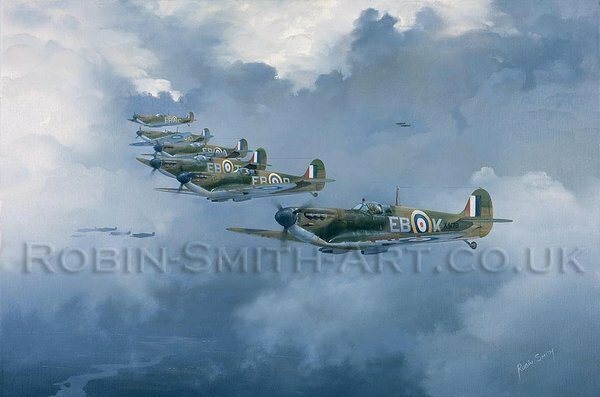 overall size 28½" x 20½"
image size 24" x 16"
"Seek and Destroy" was inspired by my interest in the Battle of Britain, and by chance being on the doorstep of two surviving BoB Aces, Doug Nicholls and Harry Baker . Formation flying has always fascinated me, and was to be the main feature of the composition. The main initial perception of the painting was to catch the feeling of actually being there in the sky amongst the clouds. This was the basis of my cloud study. I identified a small section of sky that was ideal for the job and took a photo with a 400mm lens. To assist the impression one is actually several thousand feet in the air, I darkend the bottom left corner and introduced evidence of a winding river. One model was used for the initial perspective study by positioning the close up model on a length of wire and photographing it. The next study was the same model shifted further away, slightly higher, a little rearwards, wings tilted a little and photographed. This proceadure continued untill all aircraft were captured on film. These images were then moved around on a piece of paper untill a convincing formation appeard. From this initial draft, I could see the finished painting.